Graphene is a single-layer carbon polymer. Graphene is made of pure carbon. It is a material in which the carbon atoms are arranged in a single layer, creating a honeycomb pattern. It should be stressed that this layer of carbon is only one atom thick, although some authors consider up to ten layers of carbon to be graphene. If we stacked ten or more graphene layers onto one another, the resulting substance would be called graphite, which is what we use in pencil leads. The term graphene was coined by Hanns-Peter Boehm. Some scientists refer to graphene using the phrase "zero band-gap semiconductor". It is also known under spelling variations such as grafene and graphen, but those are incorrect in English, although they might be valid in other languages. If you are interested in making your own graphene, please scroll down to How To Make Graphene at Home or visit a separate page with DIY graphene instructions only. You'll probably want to scroll down if you've already heard about making graphene with a Lightscribe DVD drive but need some graphite oxide as a starting point. If you would like to invest in graphene or a graphene-related technology, take a look at How To Invest in Graphene. Graphene was theoretically predicted by Phillip R. Wallace in his work named "The Band Theory of Graphite", published in Physical Review in 1947. Graphene was discovered in 2003 by Andre Geim and Kostya Novoselov at The University of Manchester, and results were published in 2004. For this work, they have been awarded the 2010 Nobel prize. To clarify this, even though graphene was successfully grown on various single-crystal substrates since the 1970s, it wasn’t until 2003 that graphene was finally isolated in free-form. It is interesting to know that they used ordinary sticky tape to produce small quantities of graphene. This is very significant, because the electrical and physical properties of graphene are considerably different when it is in free-form state as opposed to being bound to a supporting crystal structure. Graphene has a number of very interesting properties. 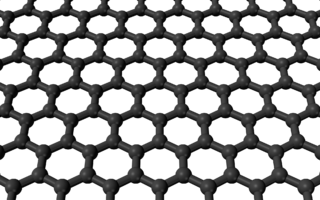 As we learned, graphene is a honeycomb structure consisted solely of carbon atoms. We are doing our best to explain these properties in layman's terms. If you'd rather see the numbers yourself, along with our sources, please visit our page on Graphene Properties. That page can come in handy if you're doing some scientific research or simply need to see where to find accurate information. Unless otherwise noted, the main focus in this article is on free-form graphene. A very important property of graphene is its unique electronic transport system and the resulting high electron mobility. Electron mobility describes how fast an electron can move through a material. Metals and semiconductors are of special interest because of their use in electronics. The electron speed is limited by interactions with the crystal lattice. In layman’s terms, when an electron is moving through the material, it collides with atoms which make up the material and those collisions slow the electron down, limiting its maximal velocity (thus heating up the material, creating nightmares for the engineers working on it). The reality, of course, is a bit more complex, but this approximation is good enough for this discussion. While silicon, which is the staple of modern microelectronics, has an electron mobility of <1400 cm2/Vs, graphene has an electron mobility 200000 cm2/Vs, almost 200 times higher than silicon. This means that electrons move much faster through graphene. Judging by this fact alone, theoretically graphene based electronic devices could work at almost 200 times higher speeds than conventional silicon-based devices. IBM researchers managed to achieve switching cutoff frequencies of up to 280 GHz in a 40-nm gate length graphene FET. Scientists expect to see graphene FET cutoff frequencies of up to 600 GHz in 2013, while the theoretical limit is up to approximately 10 THz if gate lengths are kept to a few nm. In comparison, silicon-germanium (SiGe) transistors hit a maximum operating frequency of under 100 GHz. Hopefully the graphene breakthrough will keep the Moore law going. Another graphene property tightly connected to the high electron mobility is its low resistivity. The resistivity of a sheet of graphene is 10-6 Ω*cm. To put this number into perspective, the resistivity of graphene is lower than the resistivity of silver at room temperature. By the way, at room temperature, silver was the lowest resistivity material known to scientists - that is, until graphene came along. Why is the free form Graphene superior? Free-form graphene acts as a waveguide for electrons. This means that they can flow freely without collisions, at speeds approximately 1/10 of the speed of light in vacuum. However, when graphene is grown on a substrate such as SiO2, its electron mobility reduces by a factor of five. The electron mobility reduction is a consequence of graphene’s sensitive electron orbitals, which change shape when brought in contact with other materials. This is why scientists are researching ways to more efficiently manufacture and interact with free-form graphene. Graphene probably sounds like a pretty cool material so far. If you are interested in making your own graphene, read how to make graphene or simply keep reading, the information is further down the page. Transistors in digital circuits have two distinct states, ON and OFF (transistors actually have several different states besides ON and OFF but these two are of main interest in this discussion). Pure graphene creates problems by conducting a significant amount of current even when in the OFF state. Graphene conducts current in the OFF state because it is a zero band-gap semiconductor. A zero band-gap semiconductor needs no external electrical field to become conductive. The result: graphene logic gates have a high static power dissipation - they consume power both when the device is ON and OFF. There are two approaches to counteract this problem: shorten the gate length or use doped graphene. Graphene can be doped in the same way a silicon crystal is doped. When doped with potassium ions, electron mobility can be reduced by up to 20 times. The controlled electron mobility reduction is a desired effect in such cases. Additional research is needed to reveal the optimal dopants and their concentrations. One interesting property of graphene is self-healing. This means that if we remove a carbon atom from anywhere within the graphene sheet, and then expose the sheet to carbon atoms or some carbon-containing molecules, one of them will snap into place perfectly, filling the hole created by the removed carbon atom, and fitting into the hexagonal pattern. The ability to self-heal is of great importance for nanotechnology since a single stray ion can punch a hole in the nanostructure, rendering it useless. If the nanostructure can self-heal, then it might be able to withstand the harsh environmental effects. Graphene is an extremely good heat conductor. In fact, it conducts heat so efficiently that you can cut an ice cube using a graphene sheet. Graphene absorbs the heat from your fingers as you hold it and transfers and concentrates the heat into a small area where the graphene "blade" is in contact with the ice. The ice instantly melts and as it melts, more and more heat is transferred from your hand through graphene and finally to ice, melting it further. This exciting new material is one of the strongest materials known to science. Thanks to its single-atom thickness, graphene can be packed into a small volume while retaining an extremely high surface area. One square meter (10.7 square feet) of graphene weighs under 1 milligram. That makes it the material with superior weight to area and area to volume ratios when compared to other high-specific-area materials. Despite being very strong, the carbon layer is only one atom thick and breaks easily. This makes working with graphene a challenging task. Scientists have developed materials based on graphene which take advantage of graphene's unique properties while making it thick enough to withstand much higher stresses. Graphene is available from a number of online and offline resellers. The price of graphene is not very attractive at the moment: around $300 (approx. 250 EUR) for 1 gram of pure, 3nm filtered graphene nanopowder. Of course, graphene price is expected to reduce as the number of manufacturers increases. Alternatively, if you're looking to make money instead of spending it, take a look at How To Invest in Graphene. It turns out that many readers want to make graphene at home, so here's a spoiler: it is possible to create small quantities of homemade graphene by yourself! However, although possible, it's not easy to make considerable amounts. In fact, as of this writing, scientists still have no clue how to efficiently make graphene in large quantities and high qualities, because the technological processes have not yet been developed. Still, it's pretty trivial to make DIY graphene sheets in small quantities. The bits you will be able to make in DIY conditions will be only a few nanometers in length, so forget about macroscopic graphene sheets or strips. The largest piece of graphene that you can make yourself is about 0.25mm2 (but you'll make a lot of them). That's not much larger than the area of the dot in an exclamation mark on this webpage! In industrial uses, scientists make transistors with gate lengths of under 25nm... so your dot-sized piece of graphene, although it looks insignificantly small to you, could be used to make hundreds of transistors. Still interested in making graphene? Great, read on! The first DIY method is to use a lead pencil to deposit a thick layer of graphite onto a paper. Then use ordinary sticky tape to peel off a layer of graphite from the paper. Use another piece of sticky tape to remove a layer of graphite from the first sticky tape. Then, use a third piece of unused sticky tape to remove a layer from the second piece of sticky tape, an so on. Eventually, the graphite layers will get thinner and thinner, and you will end up with graphene, which is single-layer graphite in the strict sense, or bi-layer or few-layer graphite (which acts almost like graphene in certain uses). Even though this way of making graphene is only a proof-of-concept, the sticky tape method works. It takes patience and time, but it's the DIY method which the Manchester group used in 2004. And remember, they actually won a nobel prize for their work, so there's no messing with sticky tape! A group of scientists had their article published on April 20th 2014, in which they describe how to make graphene using an approach called liquid shear exfolation. You can find the article abstract here but the full article is behind a paywall. Shear exfoliation in liquids starts by pouring powdered crystal in a liquid, and then using a shear mixer to separate (exfoliate) layers of material from the crystal. The liquid that is used in such processes is chosen so that the small graphene particles don't clump back together, and the result is a liquid suspension of graphene. The suspension can then be dried to obtain graphene nanoflakes, or it could be directly used in later technological processes, such as making of graphene coatings and others. So, how do you make graphene at home using this method? Well, you can replace the shear mixer with a kitchen blender (since shear mixing is a fancy word for high-tech blending), and instead of special liquids you can use water and dish detergent. The detergent is added so that the particles don't clump, and acts as a surfactant. A great source of graphite powder are graphite pencils. Simply powder a few pencil leads and add the powder to the detergent solution, then blend for a while. Unless you have access to special microscopes and other equipment, you will probably be unable to confirm the existence of graphene in your detergent solution, but there's a quick rule of thumb which you can use to estimate the particle size. Generally speaking, if the graphene particles are too big, they will sink to the bottom of the vessel, while if they are smaller, they will float to the top. Nanoparticles are so small that they will be suspended in mid-water, and this is what you're aiming for if you want to make graphene. After you make enough graphene particles, you might want to filter the suspension and leave it to dry. That being said, although this method of making graphene was described in the paper mentioned above and it worked for the researchers, don't get too excited about doing it at home this way. It's messy and creates very small nano-flakes of graphene, not something to brag to your friends about, unless you have a high tech lab in your basement and intend to use them to make graphene transistors. On the other hand, this technology, along with sonication assisted liquid phase exfoliation might define how graphene is made in the future in industrial settings, because of its scalability. Graphite oxide is water-soluble, so after mixing it with water, carefully pour it on a DVD disc. Make sure that the graphite oxide solution is evenly distributed on the plastic surface of the disc. After the solution has dried and created a film of graphite oxide on the disc, place the disc into the DVD drive, film-side down. Use the LightScribe software to burn in the layer of oxide. The areas of the film which come into contact with the laser beam will be turned into graphene. The laser beam causes a chemical reduction which reduces graphite oxide to graphene. The resulting graphene layer should be carefully removed from the disc and cut into appropriate sized pieces. These pieces can be used directly to create a graphene supercapacitor! This is perhaps the easiest way to make graphene at home, but it assumes that you have access to graphite oxide and a Laserscribe drive. One reader suggested that the LightScribe DVD laser can be replaced using a simple Xenon flash. If you have a photo-flash, you could try this approach as well, and report the results to us at "contact at our site domain". Another tip: do NOT do this if you are not comfortable with voiding the warranty of the DVD burner. This is the newest DIY graphene recipe we've heard so far. It involves a bit of fluid physics to explain what's going on here first. If you pour a non-water-soluble liquid into water it will either float on top of the water, or the water will float on top of it, depending on whether the added liquid is heavier (more dense) or lighter (less dense) than water. 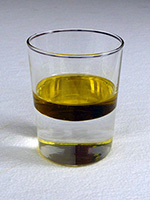 A common example is oil floating on top of water (see image). One group of scientists  discovered that you can make graphene by pouring two solvents which do not mix together, such as heptane and water, into a glass and adding finely ground graphite powder and putting it in a sonication bath. You can buy heptane in most chemical supply stores, water is readily available (it's a good idea to use distilled water), and you can easily obtain graphite sticks in art shops. An ultrasound bath is needed, but these are not uncommon on ebay and the likes. The resulting graphene is one to four layers thick, and is chemically stable. It can be extracted and deposited on a clean glass plate, or any other substrate. Graphene on the water-heptane interface. The idea is to mix the finely ground graphite with water and heptane (1:1 ratio of water and heptane) and sonicate it for a while. What happens next is that graphite flakes exfoliate at the interface between water and heptane and graphene actually starts "climbing" up the glass walls of the vial. If a hydrophilic substrate, such as a glass slide, is introduced through the interface, a thin film of graphene will climb the walls of the slide as well. The glass slide can then be extracted and after drying, you'll be left with graphene-coated glass. If you use a polyethylene vial, the resulting graphene will not climb the walls of the vial, but you can still extract it with a slide made of glass or other hydrophilic material. The result is shown in the image on the right. This is possibly the easiest way to make DIY graphene at home as an arbitrarily large sheet. Other methods only create graphene flakes, but these flakes could possibly be used instead of graphite flakes in this method as a refinement stage. Try it and let us know how it goes! How to make Graphite oxide at home? In order to make graphene at home using the DVD method listed above, you'll need some graphite oxide. You may buy graphite oxide from various sources, including online, or you may try making graphene oxide yourself. In this text, we will explain how you can make graphene oxide at home, yourself. The procedure is relatively simple and most ingredients can be bought over the counter. However, please note that this is NOT a safe procedure and following this guide could lead to explosions, fires and serious injury. For obvious reasons, should you choose to do this yourself, observe precautions when working with acids and explosive materials. As a matter of fact, we believe that unless you are a licenced chemist, you are better off buying graphene oxide rather than trying to make it at home. We offer this text as an educational resource only. By proceeding to read the following text, you acknowledge that you understand the risks of working with chemicals listed in the text and have a complete understanding of all the chemical reactions and dangers that they pose to your health and safety. To avoid fume and fire hazards, perform this experiment outdoors and in a controlled, well ventilated environment. Even though care was taken to ensure that there are no mistakes in the text, we take no responsibility for any eventual mistakes remaining in the text. If you have access to a lab and you're doing this for a project or an experiment, drop us a note and let us know how it went. We would love to include your success story here. Graphite oxide has been known for almost 150 years now. It was first prepared in 1859. There have been improvements in the process since then, and many researchers in the field commented on the potential dangers and risks associated with the original procedure as described by B. Brodie, who first discovered the process. The method outlined here takes about 2h at temperatures below 45 degrees celsius if you have access to a centrifuge. If you do not, it will take a day or so for the excess water to evaporate from the container. Stir 100g of powdered graphite with 50g of sodium nitrate into 2.3 liters of technical sulfuric acid. Make sure to mix the ingredients in a much-larger-than-needed leak-proof container placed in an ice-bath at zero degrees celsius, as a safety measure. The container should be at least 15 to 20 liters in volume. CAUTION! Add 300g of potassium permanganate to the mixture while constantly mixing the ingredients. Do NOT add all 300g in one go. Instead, add potassium permanganate gram by gram carefully to avoid heating the mixture above 20 degrees celsius! CAUTION! Potassium permanganate is a powerful oxidizer which stains skin and other organic materials such as clothing on contact. When mixed with sulfuric acid, it produces a highly explosive manganese oxide, so all safety precautions must be taken! Make sure the maximum temperature is not exceeded. After the permanganate has been added to the mixture, remove the ice-bath and bring the temperature up to 35 degrees celsius. Precisely and carefully maintain this temperature for 30 minutes. During this stage, the mixture will thicken and the amount of released gas will reduce. At around the 20 minute mark, expect the mixture to be brownish-gray and of pasty consistence. CAUTION! After 30 minutes have passed, slowly and carefully add 4.8 liters of water into the mixture while stirring. The addition of water will cause an exothermic reaction which will increase the temperature of the mixture to close to 100 degrees celsius, and large amounts of gas will be released in a violent reaction! Maintain the temperature at 98 degrees celsius for another 15 minutes. CAUTION! The mixture will now be brown in color. After maintaining the temperature for 15 minutes, further dilute the mixture to a total of 14 liters of fluid with warm water. Add 3% hydrogen peroxide in order to reduce the leftover permanganate. After the addition of hydrogen peroxide, the mixture should turn bright yellow. Filter the mixture while still warm. The filter will take a yellow-brown color. Wash the filter cake three times with a total of 14 liters of warm water. Disperse the resulting graphite oxide in 32 liters of water. In order to obtain dry graphite oxide, you would need a powerful centrifuge. Since this is probably not available, heat the water containing graphite oxide to 40 degrees celsius and wait until the water evaporates. A wide container works best, since the larger area will facilitate evaporation. Higher quality graphite oxide obtained in this fashion will have a bright yellow color, while poorer quality graphite oxide will take on a green to black hue. You can use this graphite oxide in an aqueous solution to perform your experiments with Lightscribe drives at home. For your convenience, we provide the original paper where this process was described. 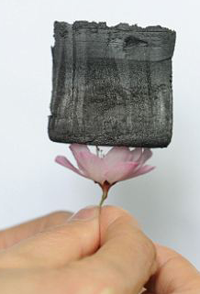 We used this paper as the basis for our guide on how to make graphite oxide at home. If in doubt, follow directions from that paper instead of directions stated on our website. There are also several Youtube videos that show the complete process, and those might be a valuable resource as well. We would like to thank our visitor Hera, who contacted us pointing out a typo in the text. This page was last modified: June 6th, 2014.